The Spring Soccer Season has started in the South Jersey area. 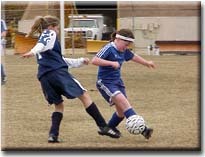 In the first week, if you played on Saturday, it was cold and windy and if you played on Sunday, it was a very nice spring day. The second week was just the opposite. The temperatures change for both weeks was around 30 degrees difference on each day. Bill Connolly, Anthony Diorio and Sean Zahacewski scored two goals each as Cherokee defeated Washington Township 8-5 in the third and deciding game of the SJHSIHL Tier 1 Varsity Championship series. 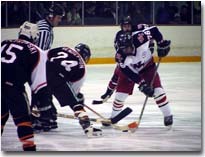 Cherokee started slowly falling behind by two goals in the first period, but as true champions usually do they finished strong scoring four goals in the third period. Township broke out on top first as Nick Martorano scored the first of his two goals, converting a pass after some hard work in the corner by Eric Marano. Connolly, who played his best game of the series, tied the score at 1-1 scoring on a back-hander from his knees with just over two minutes remaining in the opening period. Instead of closing out the period thinking defense first, three goals were scored in the final minute. South Jersey Sports Online and The Topcat & Taggart Sports Show are giving our readers the chance to win great prizes. The following authors will appear on The Topcat & Taggart Sports Show (Sundays between 4:30-5:30 PM on WNJC 1360-AM) courtesy of Sports Publishing, LLC in March/April 2002. We are giving away copies of these books during the show. Just call the WNJC 1360 studio lines at 856-227-1360 or 856-232-7077 and answer one of our sports trivia questions. Hurry...there are a limited number of copies available !!!! Jay Bratton and Brandon Jackmuff scored two goals apiece to pace West Deptford to a 7-4 victory over Lenape and the first SJHSIHL Tier 2 title. After the teams traded power play goals in the first period, West Deptford took the lead for good at the twelve-minute mark. Rob Garish won the face-off and drew the puck back to the point where Brett Gibbs was waiting and his slap shot found the back of the net for a 2-1 lead. 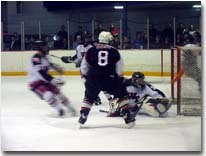 Ninety seconds later Jackmuff made it 3-1 scoring on a rebound off a Chris Mc Illvaine shot, with Lenape short-handed. Washington Township scored four goals in the last four minutes of the first period and skated to a 7-2 win over Cherokee. With the win, Township has forced a third and deciding game in the SJHSIHL varsity championship last night at Voorhees in front of a standing room only partisan crowd. Eric Marano led Township with three goals and Pat Henderson scored both Cherokee goals. But the key contributors were Coach Schauffele's Tier 2 line of Jason Pelle, Mike Duczkowski and Chris Keyser as all three contributed goals, with Pelle adding two assists. The game was scoreless until the four-minute mark, with neither team coming close to scoring until Nick Martorano was all alone in front but Chris Sabol stoned him. 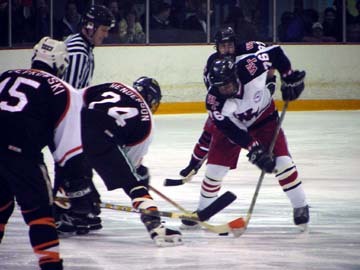 After Pelle won the face-off, Duczkowski put the puck on net and Keyser banged home the rebound to put Township up 1-0. Woodrow Wilson's road to the championship came to an end, but not the way they wanted. In the South Jersey Group 3 boy's playoff game held at Eastern High School, the Lakewood Piners finally ended the eleventh seeded Tiger's run at the title. The Piners were able to found a way to solve Wilson's aggressive defense and pull away for the 67-59 victory. Lakewood's DyQuan Randolph and J.R. Smith had all of the answers against Woodrow Wilson in this championship game. Philadelphia KiXX defender and Pat Morris and player/coach Omid Namazi have been invited to participate in the upcoming U.S. Futsal National Team Training Camp in Washington, DC from March 17-22. Brad Miller scored with six minutes left in the game to snap a 4-4 tie and give West Deptford a 5-4 win in game 1 of the Tier 2 championship. Game 2 is Wednesday night at Skate Zone in Voorhees. Brandon Jackmuff led West Deptford with two goals and an assist; Tom Lizzio paced the Lenape attack with two goals. After Brett Gibbs scored just over a minute into the game on a shot that seemed to handcuff Lenape goalie Jason Herbert, Chris Sullivan tied the score at 1-1 jamming home a rebound of a shot by Kurt Schnepf. Pat Henderson scored four goals as Cherokee rallied from a two goal deficit to beat Washington Township 7-5 to take game 1 of the best of three championship series in the SJHSIHL. 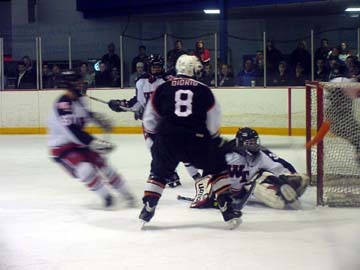 Mike Duczkowski led Township with two goals. Township had the lead at 4-2 late in the second period on goals by Chris Keyser, Joe Pelle, Duczkowski and Nick Martorano surrounded by two from Henderson. But momentum switched when Townships' Pelle was called for a penalty and after disputing the call received an additional minor and a game misconduct. Bill Connolly scored on the man advantage in the last ninety seconds of the period and Cherokee was to within 4-3 heading into the final period.